30.9.1898: Launched by Mackie & Thomson, Govan (Yd.No.242) for The Great Northern Steamship Fishing Co Ltd (64/64), Hull as EDITOR. 25.1.1899: Registered at Hull (H422). James Leyman appointed manager. 1906: William R. Nowell appointed manager. 1913: Fred Smith appointed manager. 12.1914: Requisitioned for war service as a minesweeper (1-12pdr) (Ad.No.398). 10.1918: Sold to Charles Dobson, Grimsby and others. 24.10.1918: Registered at Grimsby (GY1218). Charles Dobson designated managing owner. 25.7.1919: Sold to Naylor, Bull & Co Ltd, Cardiff. Frederick G. Naylor, Grimsby appointed manager. 2.1923: Sold to Charles Dobson, Grimsby & others. Charles Dobson designated managing owner. 6.1929: Sold to John Thomas Webb (22/64), George Warman (21/64) and William Hutchings 2(21/64), all Lowestoft, Lowestoft & others. 27.6.1929: Registered at Lowestoft (LT92). William Hutchings designated managing owner. 15.2.1930: Sold to William Hutchings (43/64) and George Warman (21/64), Lowestoft. 8.3.1930: Sold to Sydney Loose (22/64), George Warman (21/64) and William Hutchings (21/64), Lowestoft. 1930: Fishing out of Fleetwood. 25.11.1930: At Bangor Magistrates Court, Sk. 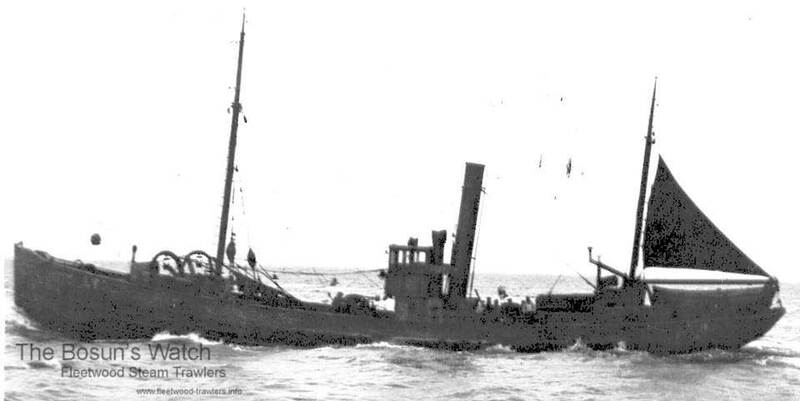 Herbert Plant was fined £10 for trawling within limits off the Anglesey coast. 4.4.1933: Fishing out of Aberdeen. 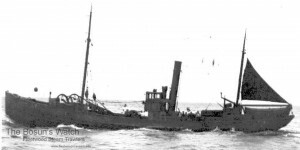 Foundered in North Sea off Aberdeen in position 57.10N 1.30W after springing a leak; all nine crew rescued. 9.5.1933: Lowestoft registry closed “Total loss”. This entry was posted in Steam Trawlers and tagged No Fleetwood owners on December 18, 2014 by Fred Smith.